Wednesday evening, a huge front moved through Oklahoma spawning 17 tornadoes. Thankfully, many of them were F1 with winds not exceeding 105 mph. The Emergency Alert System was activated on our cable TV interrupting programming on all channels. I took a picture of the alert with my cell phone camera. The quality is very poor. 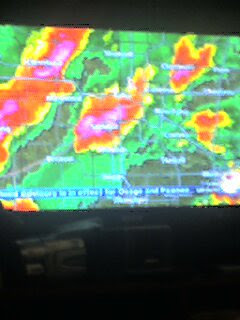 This is the radar image on CBS Tulsa Affiliate KOTV Channel 6. We didn't get to watch CSI, but at one point there were 7 counties in the viewing area with current tornado warnings! 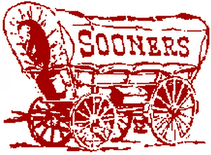 Even for Oklahoma, that is a big deal. I took another picture of the TV image with my cell phone. Here in Wagoner, we had a gust front with winds of 40-50 mph but, once again, the storms went around us. I was at St. Anthony's Orthodox Church, listening to Franky Schaeffer, the son of Francis Schaeffer. The lecture got interrupted by the tornado siren, we all ended up in the church basement, continuing there. Matthew 8:27... even the winds ..obey Him!